It started with a chilled morning as we arrived at 4:15 am in the morning and soon we went to the retiring room – special thanks to Indian railways for providing such a facility, after taking an hour nap we were all set and energized for WordCamp. I would like to introduce my friends Animesh Jain, Manglam Gupta and Prateek Shukla. I and Animesh were the volunteers at WordCamp Nagpur and had a duty at community room. Finally, we reached the venue that was Chitnavis center, the place was very good and attractive. We met other attendees and volunteers at the center and in some time all the organizers and volunteers were there and everything started with the lightning speed. The registration desk was set up in the first place and all the id cards and kits were distributed. The first day of WordCamp was very good and interesting as it was a great experience meeting great speakers and great people in WordCamp. After the WordCamp, we found a hotel in Nagpur at a very interesting area that doesn’t sleep at night at that particular time of Ramzan. We took rest for about 4-5 hours in the hotel room and then a great task was waiting for us, the ultimate vegetarian food finding challenge that is very difficult in Nagpur but eventually we succeeded after traveling 4 km from our place and returned back to the hotel room after our food challenge. The night was very interesting as the whole area of our stay was a very big market that was selling various and interesting stuff around. After roaming in the whole area with a great crowd present there that was totally unexpected for us as the population is quite less in Nagpur. We finally went back to our hotel after roaming around for a nap around 3:00 am. The second day of WordCamp was another interesting day with so many speakers and parallel sessions around. Sponsors were given Sponsor Desks for interacting with the attendees in WordCamp. It is always been a pleasure to meet sponsors at WordCamp and I really wanna thank for all the super cool stuff especially for the batches we got and even a wireless mouse from reseller club. 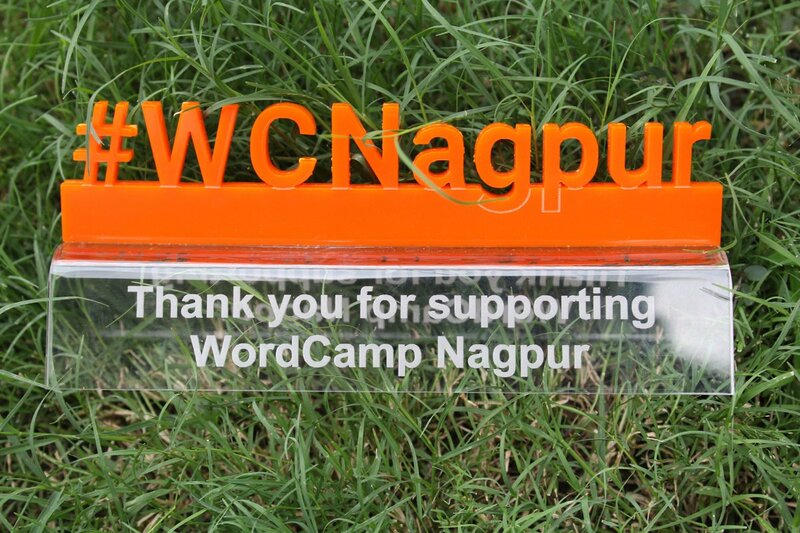 WordCamp Nagpur was a real success and even there was a memento for every volunteer stating thanks for supporting WordCamp. We left the center around 6:00 pm as we were having our train at 10:00 pm for Bhopal and went for dinner at a cool Italian restaurant guided by Abhishek Deshpande – Lead organizer of WordCamp Nagpur. Soon after our dinner we went to the railway station with an auto rickshaw and came back to Bhopal after an overnight journey.